All of the rocks from the Ultramafic series of the Stillwater Complex are enriched in PGE relative to most mafic magmas. Furthermore, the chromite layers are particularly enriched in IPGE (Os, Ir, and Ru) and Rh. This enrichment appears to be a common characteristic of ultramafic rocks from many types of settings, layered intrusions, ophiolites, and zoned complexes. We have carried out a petrological, mineralogical, and geochemical study to assess how the enrichment occurred in the case of the Stillwater Complex and applied our results to the chromite layers of the Bushveld and Great Dyke complexes. The minerals that now host the PGE are laurite and fine-grained intergrowths of pentlandite, millerite, and chalcopyrite. The laurite occurs as inclusions in chromite, and mass balance calculations indicate that it hosts most of the Os, Ir, and Ru. The sulfide minerals occur both as inclusions in chromite and as interstitial grains. The sulfides host much of the Pd and Rh. The IPGE and Rh correlate with Cr but not with S or Se, indicating that these elements were not collected by a sulfide liquid. Palladium, Cu, and Se correlate with each other, but not with S. The low S/Se (<1500) of the whole rock and magnetite rims around the sulfides indicate some S has been lost from the rocks. 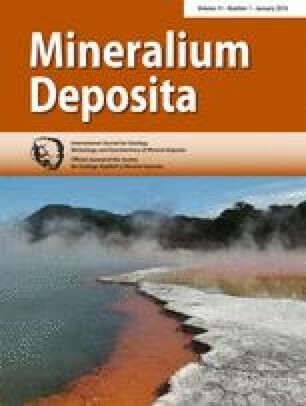 We conclude that to account for all observations, the IPGE and Rh were originally collected by chromite, and subsequently, small quantities of base metal sulfide liquid was added to the chromite layers from the overlying magma. The IPGE and Rh in the chromite diffused from the chromite into the base metal sulfides and converted some of the sulfides to laurite. The online version of this article (doi: 10.1007/s00126-015-0587-y) contains supplementary material, which is available to authorized users. We would like to thank Mr. Dany Savard and Ms. Sahdi Mehdi for their careful analytical work. The reviewers, Prof. Alan Boudreau Dr. Steve Barnes and Dr. M. Fiorentini are thanked for their detailed reviews. This work was funded by a Canadian Natural Science and Engineering Research Council Discovery Grant to SJB (17313) and a Canada Research Chair program grant to SJB (215503).